I blinked and there we were, three weeks into May! Well, it’s all been happening around here. After weeks of being cooped up by the interminable grey weather, we’ve finally been granted a summer and we’re making the most of it! If you're familiar with my stitch work, you probably won't be surprised to know that I'm very interested in Britain's ancient history, especially the remains left in the landscape from the neolithic to the Iron Age. Over the Bank Holiday weekend the OH and I travelled to Overton Hill, the start (or end I suppose) of The Ridgeway (one of the oldest paths in England) and walked a 5 mile circular route taking in Silbury Hill, West Kennet Long Barrow, Avebury Stone Circle and a short stretch of the Ridgeway back to the start/end. Of course we chose the hottest day of the year, but somehow that didn’t matter because I was finally getting to see places I’d wanted to visit for a very long time. As it was a Bank Holiday we’d anticipated Avebury (biggest stone circle in the country - with a village inside the circle) being very busy, and I suppose it was, but it didn’t detract from what I thought was an incredible atmosphere. Although I think perhaps that walking there, seeing West Kennet and Silbury Hill on the way, had prepared me by working its magic. There is certainly something so different about the whole landscape in that area, literally teeming with ancient earthworks, stone circles, barrows and mounds. By the time we reached Avebury in the very hot mid afternoon, I was happily away in another dimension. 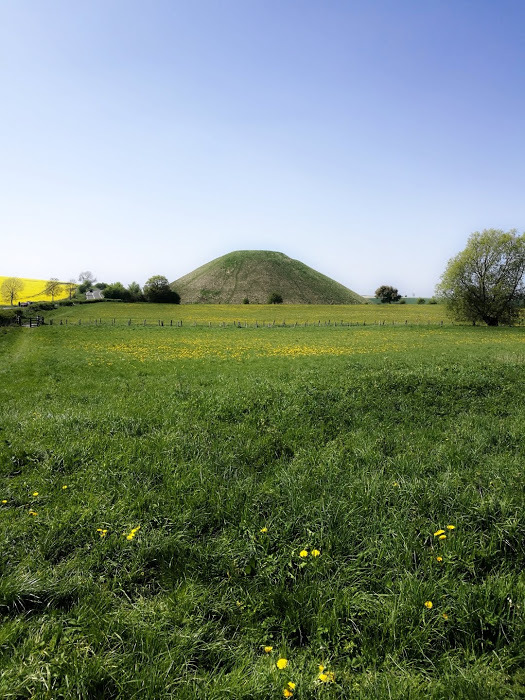 Silbury Hill - despite archaeological investigations, no one has yet established a reason for it's creation. It's one of many mysteries in the landscape. Avebury stone circle - of course without a drone or helicopter it's difficult to give any impression of the scale of Avebury. In fact there are three circles in all contained within a massive henge. Walking back towards The Ridgeway even small copses of trees turn out to be guarding ancient burial mounds. The air was tingling. That evening we had dinner in Laycock (the village where the 1995 BBC Pride & Prejudice was filmed) and then walked across the river and around Laycock Abbey as the sun went down. We watched bats flitting past and a heron fishing in the river and as we approached the Abbey in the gathering dusk, the one window illuminated from inside was the famous oriel where arguably the first ever photograph was taken by William Fox Talbot in the summer of 1835. A truly magical day. After that we slipped over the Severn Estuary and met up on the Monday with my brother at Chepstow Castle. Chepstow is a lovely historic town and the castle has such a long and fascinating history, perched up on the cliffs above a turn in the notoriously wriggly River Wye, it’s a perfect place to spend a lazy day wandering about. Although it was so hot when we were there we had to pace ourselves and stop frequently for tea and ice cream. Then last week we nipped up the M1 to Leicester and paid our respects to Richard III again, this time we weren’t rushing so much so we made it to the Richard III experience across the road from the cathedral. Have you been? I enjoyed it, although I thought the historic background on the ground floor was a bit thin on detail. But upstairs, the exhibition of the dig that uncovered Richard was enthralling. I must admit to feeling quite moved by the whole thing. It’s hard not to feel that there was some guiding hand pointing to the spot where his bones were lying and encouraging those who were so committed to finding him. Well, it made me wonder. 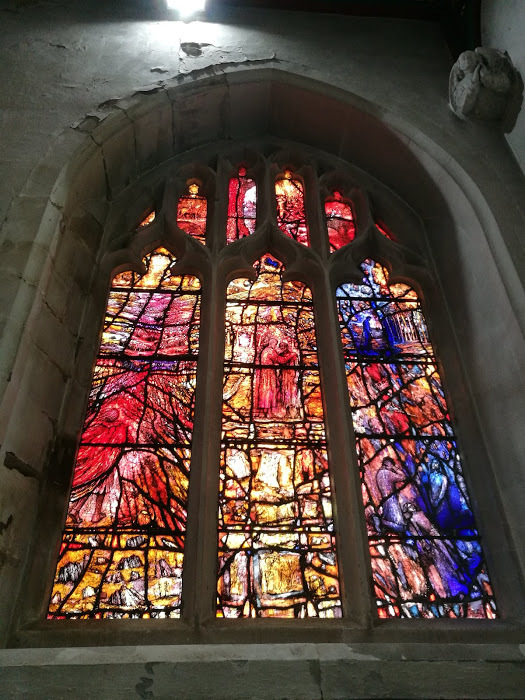 In the cathedral, the chapel beside Richard III’s tomb has two windows specially created for the occasion of Richard’s interment by my favourite stained glass artist, Tom Denny. So you can imagine, I took about a zillion photos and spent a long time gazing up at the windows. They have a strange power, they always seem to draw me in, I feel as if I'm becoming part of the story. Quite hypnotic. Meanwhile, out in the lane the transformation from spring to summer has gone on apace. 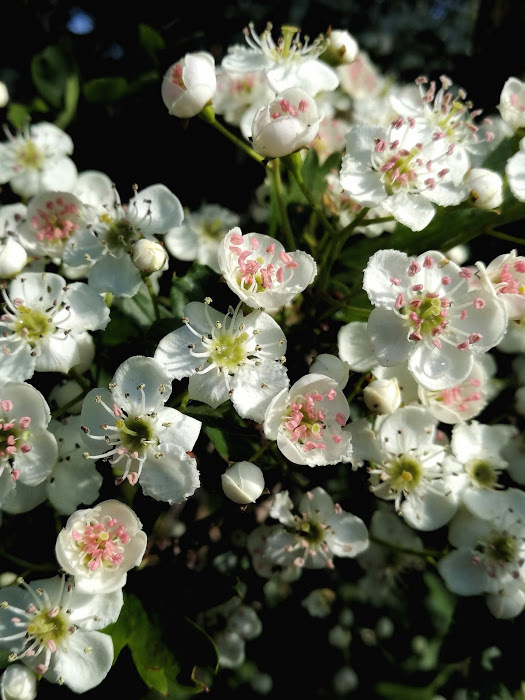 There’s so much may blossom this year, surely it must be more than recent years? But not just the hawthorn, we’ve had a wonderful carpet of bluebells, lilac, apple blossom, stitchwort, holly blossom and cow parsley. Yesterday I noticed the first buds on the dog roses - I love these, especially when there’s been a little rain and the raindrops are caught in the ridged leaves. Our morning walks have been even more uplifting for the last couple of weeks as every day seems to bring on some new flower to make you smile. Thank you so much to everyone who messaged me after the last journal post. It does help to see through other people’s eyes, and I have persevered with the smaller piece which I’ll show you shortly. But I said last time that I needed to play, and that’s what I’ve been doing. Experiments with acrylic paint and ink on canvas. I miss getting the paints out and it felt good to use them again. This is the first time I've used them on fabric. 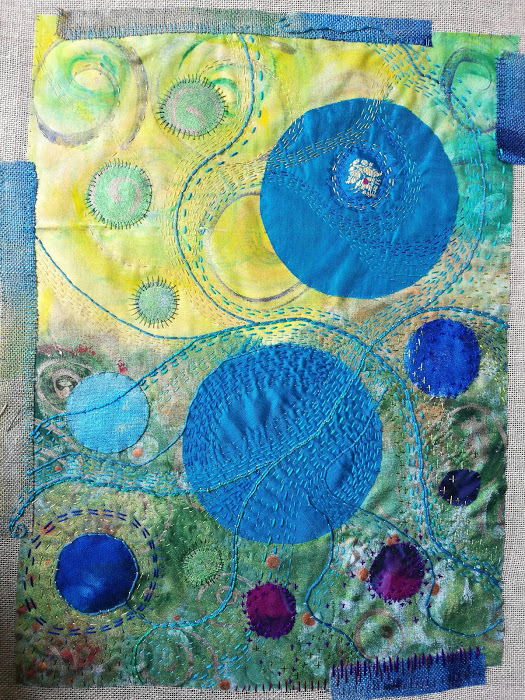 Inspired by Stephanie Redfern’s book, I got out my old acrylic paints, taped a variety of plain fabrics to a board and splashed the paint about. It was hugely cathartic and it fascinated me to see how differently it looked on the various substrates as it dried. It’s helped enormously to just stand there and experiment, now in my mind I’m already thinking about what I want to try next. From the pieces I painted, there’s one waiting for me to work at it with threads and there’s this one, which I decided to go straight to work on. The background is hand painted with acrylic and metallic inks and then I’ve stitched on some silks and worked over the whole in threads. I’m not sure if it’s quite finished yet - nearly though. So, all in all a busy but productive couple of weeks. I hope you’re also having a good time with your creative work at the moment, it’s such a cyclical thing isn’t it, we have to find a way to work with the flow.